The Mercure Paris Gobelins Place d'Italie hotel team welcomes you to Paris! Enjoy the peace of our garden terrace and take advantage of our central location to visit the City of Light at its best! With direct access to most of the major Parisian train stations, the Mercure Paris Gobelins Place d'Italie hotel is has a lush green garden terrace with views of the Eiffel Tower on different levels. A stone's throw from Place d'Italie, relax in one of the tranquil and stylish rooms. Unwind in the peaceful surroundings of the hotel garden during your business trip or after a day of sightseeing. warm, high-quality and near Chinatown in Paris! With the metro very nearby, you can reach the Louvre in 25 minutes, the Eiffel Tower in 30 minutes and the AccorHotels Arena sports and music venue in 12 minutes. A short walk from the Place d'Italie, in close proximity to the Quartier Latin, the Panthéon and Notre Dame, make the most of every moment of your business or family trip to discover or rediscover the heart of Paris and its cultural heritage. 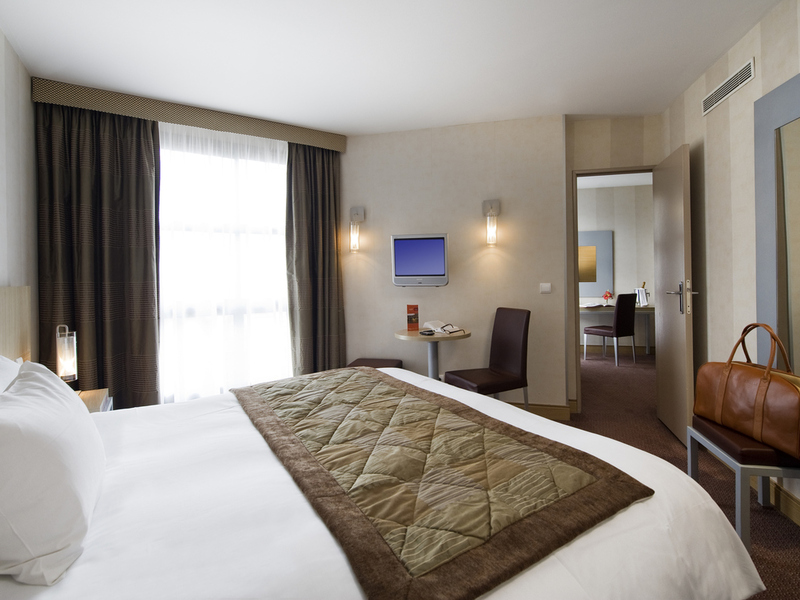 Choose from our designer rooms (renovated in 2009) with views of the Eiffel Tower and our garden. A Junior Suite is also available. Basic. We did not feel comfortable. Alas a disappointment. It was perfect for our trip. Very friendly staff, nice room and good breakfast. The kettle in the room is always very welcome. Extremely pleased with the accommodations and helpful staff. I enjoyed staying at Mercure. The room was very clean and comfortable, complete with a hotpot and selection of coffee and tea to start each day. The desk staff were very friendly and made arranging transport to the airport painless and affordable, with their 24-hour shuttle service. They took care of all the details. Very good hotel with very friendly employees especially at breakfast. Very positive experience at the registration. Clean room and great breakfast. using the network HOTEL_MERCURE_GOBELINS, with the assigned password, does not work OK ( slow and unreliable..) Using the *open' network &quot;ACCORHOTELS-GUEST&quot; work much better ?? Why? The hotel to me is a home, each year I come here a few times. From management to the staff, everyone is nice and helpful. The location is fantastic. The reception was amazing, I got a very beautiful room with a nice view over Paris, the breakfast was very good... I am very satisfied with my overall experience! Filling at home. Very convinient location. Welcoming stuff...willing to share. This was not a **** experience. We we expect a 4 star hotel to be 4 star in every room category, not just in Privilege rooms. Our room was very small with obvious efforts made to squeeze amenities into too small a room. The bed is queen size, and was good, but the furniture was cheap: metal and chipboard and pressboard covered with a fake veneer film or melamine. To fit in closets, they surrounded the bed headboards, so one's head was right next to the closets. A built-in tiny, obviously pressboard shelf, just sitting there, was a poor excuse for a night table. There was one desk chair and a stool to sit on, but there was really no room for them. The bathroom looked nice and modern at first glance, but the vessel sink didn't drain properly and in the corner of the bathtub/shower combo we saw some BLACK MOULD. One had no control over heat or cooling as it was set on central control, but the window opened. The room was quiet and the hotel looked very inviting from the court yard. It also seems to have some nice outside areas, but the weather was not conducive to using them. The reception area does not compare to other 4 Star hotels we have stayed in, like Accor's Ink Hotel in Amsterdam, or competitor's Crown Plaza. We had booked 6 nights, 2x3 on a 3 for 2 special, so the price was not bad for Paris, but it was not a good deal. At full price, we would have been furious and could have done much better elsewhere. As it was, we left the room at 10 a.m. and returned at 10 p.m. because the room was really not suitable for anything but sleeping. We spend 2 months in Spring and again in Fall in France. Although we have our own place there, we take one or two side trips each time. Accommodation-wise, this was the worst. Pleasant room with a view over the courtyard. A quiet haven in a busy city.